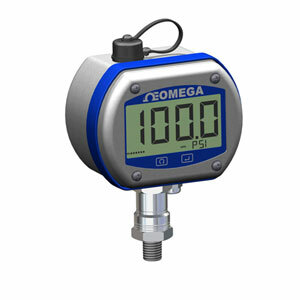 OMEGA’s DPG409 Series incorporate a rugged, 316 Stainless Steel enclosure that is designed specifically for wash-down, hygienic and marine applications. The large backlit LCD display features 25 mm high digits that make reading at distances up to 10 metres easy. Models are available with integral standard or hygienic pressure sensors that incorporate highly stable silicon wafer technology which is micro-machined to precision tolerances and then has strain gauges molecularly embedded. Standard features include: internal battery or external DC power supply operation, analogue output and user programmable alarms. A variety of user-configurable options and settings include: update rate, display damping, units, backlight, and auto-off. Nota: Each unit comes complete with setup and configuration software, USB cable, 5-point traceable Calibration Certificate, 2.7 metre analogue output cable with ferrite, and operator's manual.